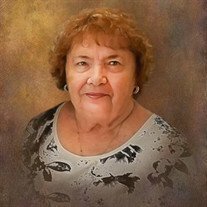 Therese M. Clark, 81, of Rehoboth Beach, DE passed away peacefully on March 29, 2018 at home surrounded by her loving family. Therese was born on October 3, 1936 to the late J. Willis Smith and Thelma Anna (Foley) Smith. At birth, Therese was born premature at only 2 pounds. Due to the ingenuity and love of her family she was able to survive to the amazement of medical personnel of that day. Therese attended St. Rose of Lima School and graduated from Institute of Notre Dame in 1954. While attending a football game, Therese met a young handsome Navy Sailor from Brooklyn, MD who was home on leave; they went on a date before he reported back to base and the rest was history. She married the love of her life George Robert Clark on July 9, 1955 at St. Rose of Lima Church on a sweltering summer day. Therese and George made a commitment in front of God and their families which lasted 62 years. Once married, Therese and George made their home in Brooklyn, MD. She was an attentive mother to her five children. She saw to it that their educational and spiritual development was cultivated through the Catholic school system. After her children were older, she worked for the court systems of the State of Maryland. She enjoyed genealogy, and was a member of the Anne Arundel Historical Society. She also enjoyed traveling, gardening, but most of all her family. Her life became sweeter with the addition of grandchildren and great-grandchildren. Therese not only raised her children, but took care of and advocated for her sister, Mary Agnes, who was born with cerebral palsy. Therese will be remembered for her infectious laugh, love, support and devotion to her family. She was preceded in death by her parents, and sister, Mary Agnes Smith; brother, Ross Smith; son-in-law, David Cheslock; sister in-law, Audrey Sweiger. She is survived by her husband, George Clark; children, Claire Cheslock, Julie Leusner, Jeannine Clark, David Clark, and Therese Murphy; brother, Jerry Smith (Claudia); son and daughter-in-law, Steven Leusner and Karen Murphy; grandchildren, Jennifer Cheslock, Elizabeth Ventura (Michael), Raquel Leusner-Jones (Justin), Carly Leusner, Aaron Cheslock (Nicole), Chelsea Leusner, Samantha Cheslock, Megan Schmier, Jacob Wishart, Kathryn Schmier, Andrew Murphy, Jamie Murphy, and Benjamin Wishart and 7 great grandchildren, Julia Ventura, Dalia Ventura, Lilia Ventura, Jackson Pfeffer, Maxton Pfeffer, Jack Cheslock and Baby Leusner-Jones; sister-in-law and best friend, Patricia Bendix, sister-in-law, Lois Smith; and a host of other family members and special friends. The family will receive visitors at Singleton Funeral & Cremation Services, P.A., 1 2nd Ave SW (at Crain Hwy.) on Monday, April 2nd from 11:00AM until 1:00PM. A Celebration of Life Service will follow at 1 PM in the funeral home chapel. Interment Crownsville Veterans Cemetery. In lieu of flowers, contributions in her memory may be sent to Delaware Hospice Center, 100 Patriots Way, Milford, DE 19963 or the charity of your choice.